If you look carefully, can you decipher the words “H.Gadsdon & Sons Established 1835″ on this wall in Crispin St ? This feint sign – painted out a generation ago yet still just legible if you know what you are looking for – constitutes the last visible evidence in Spitalfields of the five generations of Gadsdons who lived and worked here over three centuries as silk dyers, coach platers and ironmongers. It was pointed out to me by Peter Gadsdon, who came back recently to see how life has been ticking over in the old neighbourhood since his last relative departed, more than half a century ago. Working from the starting point of a family tree in an old bible and, by writing to every Gadsdon in the telephone directory, Peter Gadsdon has worked conscientiously, reconstructing the history of his ancestors, over the past ten years. “I wouldn’t say they lived in poverty, but some of the streets they inhabited – where Liverpool St Station is today – were classified as slums, and learning about their lives has made realise how lucky I am,” he admitted to me. 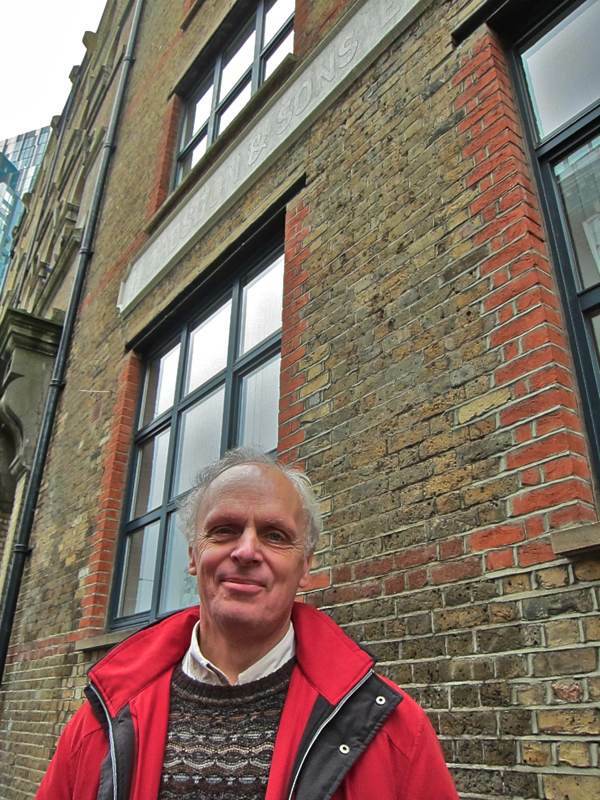 The return of descendants of former residents is a regular and welcome occurrence in Spitalfields. Commonly, I am the one to greet them and often they speak so vividly and with such knowledge that it feels – as it does in Peter’s case – as if they are the actual embodiments of their forebears returning from the past. “I have always had an interest in the East End since I visited Club Row, Brick Lane and Petticoat Lane when I was a teenager. And although I knew that my father was born in Hoxton, I did not know about the connection with Spitalfields until I started to research my family history. 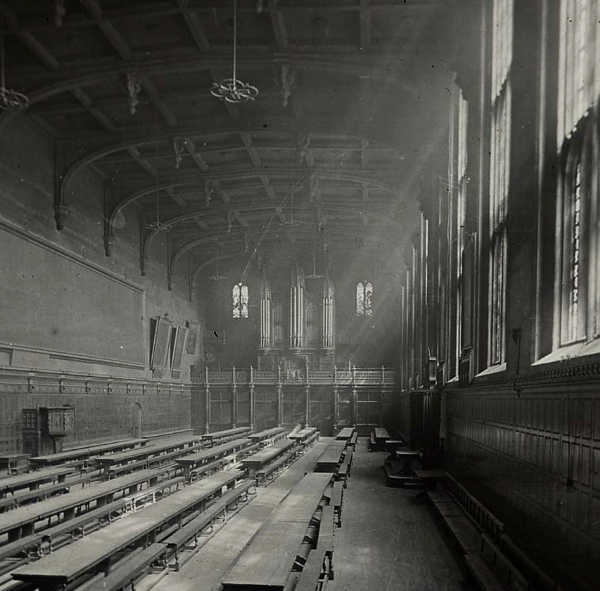 On leaving in 1790, the charity school paid for Henry’s five year apprenticeship as a silk dyer at the cost of five pounds and then he set up his own business in Spitalfields, the centre of the silk industry. The first date we know for his business is 1805 in Holden’s Triennial Directory at 26 Paternoster Row, now known as Brushfield St. On a map from 1799, Brushfield St is shown divided in two – from Bishopsgate to Crispin St was named Union St, and from Crispin St to Christ Church was Paternoster Row. In the eighteen twenties, Henry formed a partnership with a Richard Harmer, listed as Gadsdon & Harmer, dyers, scowerers and calenders in Pigots 1828/1829 Directory. 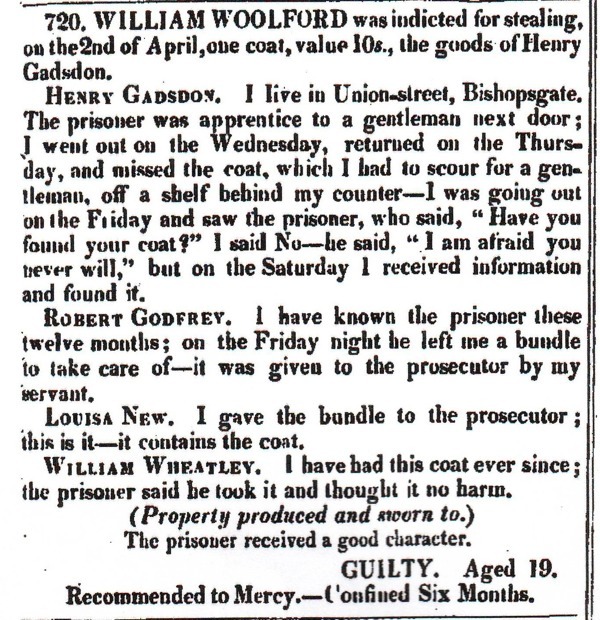 The next we learn of Henry is in the Old Bailey records when a coat is stolen from his business premises in 1830. On retirement, he moved across the Thames to Deptford and his first wife Elizabeth, née Harvey, passed away shortly afterwards. The custom in those days was commonly to return the body to the parish where they had lived and she was buried in Christ Church, Spitalfields, where eight of her nine children had been baptised and one infant was buried. In 1839, little more than a year later, Henry married for a second time to Charlotte Benskin and moved out to the hamlet of Hatcham, New Cross. He died in 1849 and is buried in Nunhead Cemetery nearby. Of Henry’s children two of his sons followed him to Christ’s Hospital School and on the application it states “A wife and eight children, one already at Christ’s, six under the age of fourteen years old, income under one hundred pounds per annum.” They were supported at the school by the Skinners’ Livery Guild of which Henry was a member. Another of his sons followed Henry into the silk dying trade, but by now the silk industry in Spitalfields was in its last throes. Henry had a younger brother, Richard, who also had a business in Union St. Richard trained as a coachplater, making ironmongery for horse drawn carriages. 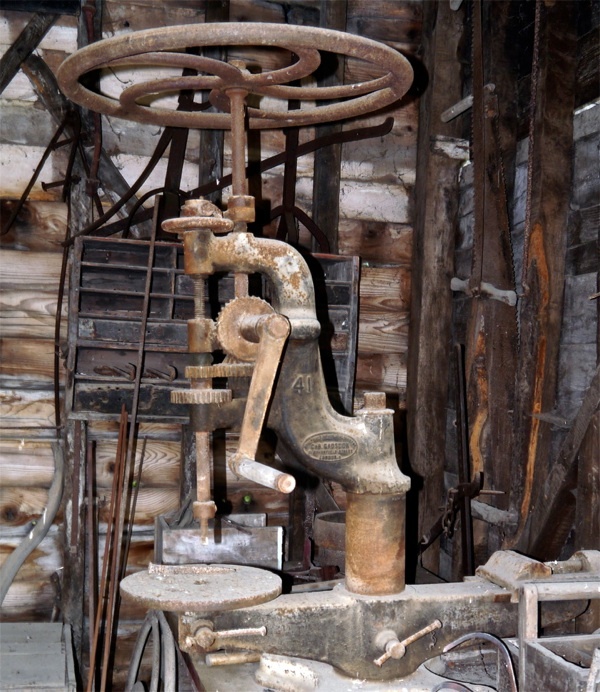 A description from an encyclopaedia of Carriage Driving is as follows – “His job was to make such parts of the carriage as the door handles. He also prepared metal furniture for the harness. The average wage in the first half of the eighteen hundreds, for a plater, was thirty shillings a week.” Another brother, George. was also a coachplater who lived in nearby Gun St and I would assume that he worked with Richard when he set up his business in the early eighteen hundreds. Advertisements show that they sold American wheels for carriages, and varnishes, japan and colours for the carriage trade. 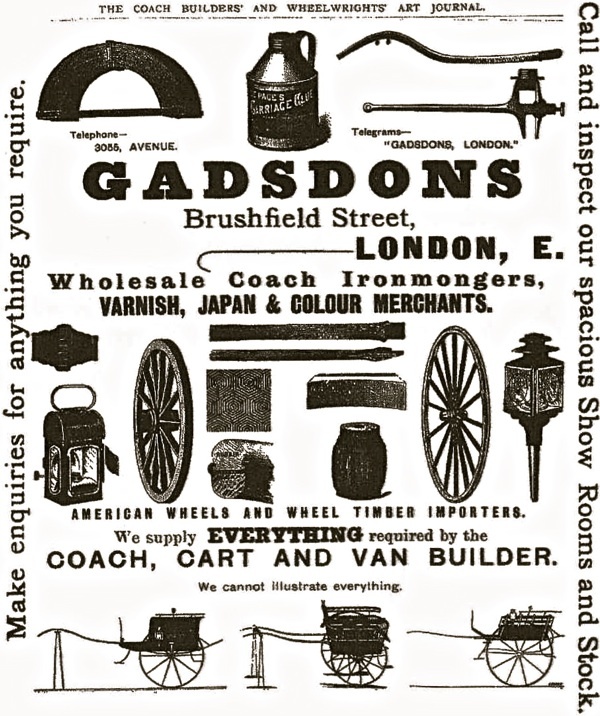 As the years progressed, they also moved into the motor car business and an advert from the turn of the century announces Gadsdons selling foot warmers suitable for both carriages and motor cars. 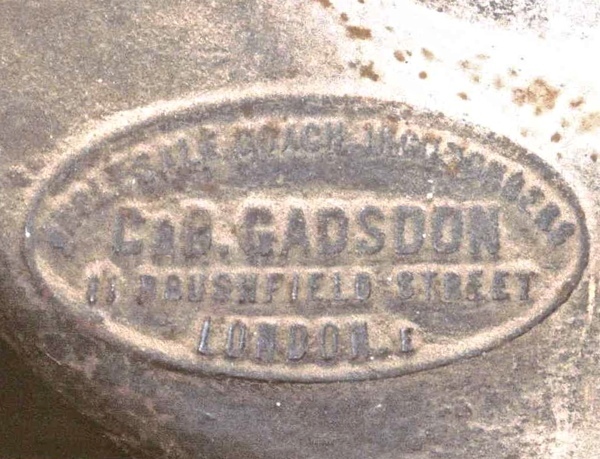 Today, there is still a premises with the Gadsdon name on it in Spitalfields at number 49 Crispin St, though I am not sure if this is the carriage firm or if it is another part of the extended family. In 1926, a new Gadsdon premises of four storeys was built at the corner of Brushfield St and Duke St.
Christ’s Hospital where Henry Gadsdon, Peter’s great, great, great grandfather was a pupil at the beginning of the nineteenth century. 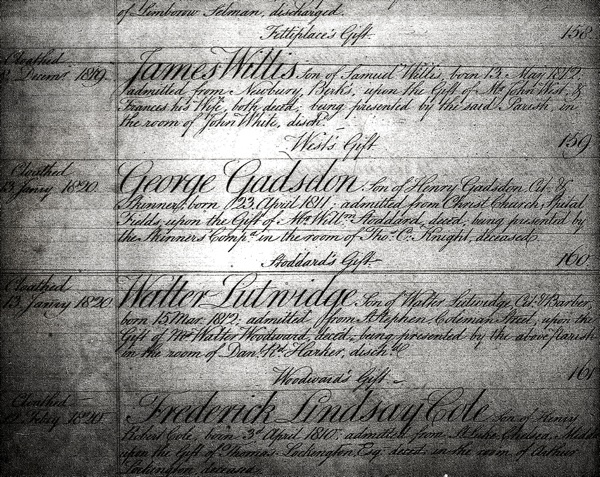 The entry in Christ’s Hospital register recording the admission of Henry Gadsdon’s son George of Spitalfields in 1820. 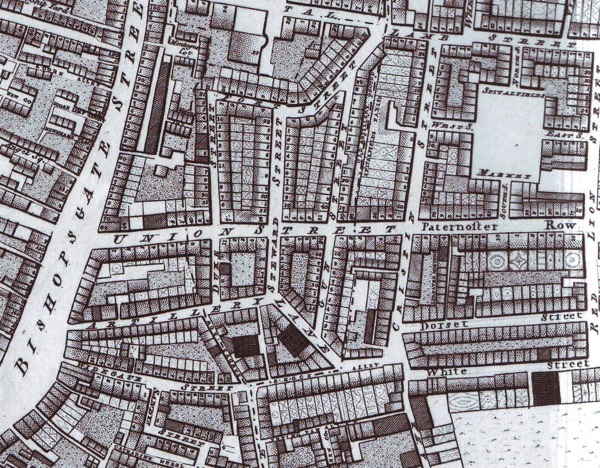 This map of Spitalfields by John Horwood (1794-99) shows the street we know as Brushfield St divided in two and named Union St and Paternoster Row. 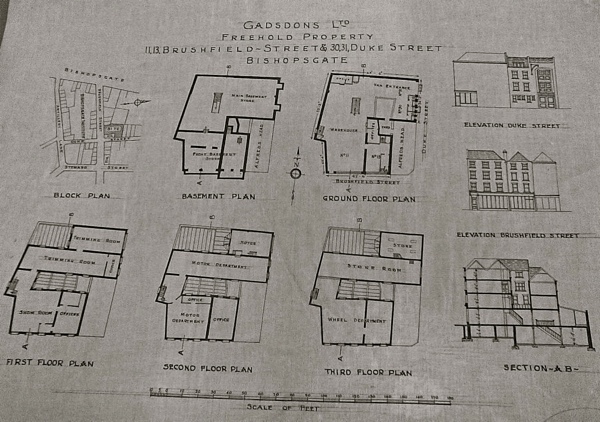 Plans for the construction of Gadsdons on the corner of Brushfield St and Duke St in 1926. Wholesale Coach Ironmongers, C & B Gadsdon, 11 Brushfield St, London E1. I really enjoyed this article – family history and local history rolled into one, as it should be! Excellent article! I look forward to my daily Spitalfields Life. I hope to visit the area next year to learn more of my Huguenot family, mostly silk weavers and my Carey line who were umbrella makers. Keep up the good work! Makes you wonder how many descendants of Spitalfields silk weavers there are. Like Peter I had no idea that my ancestors were among them until doing the family history. Another great article. 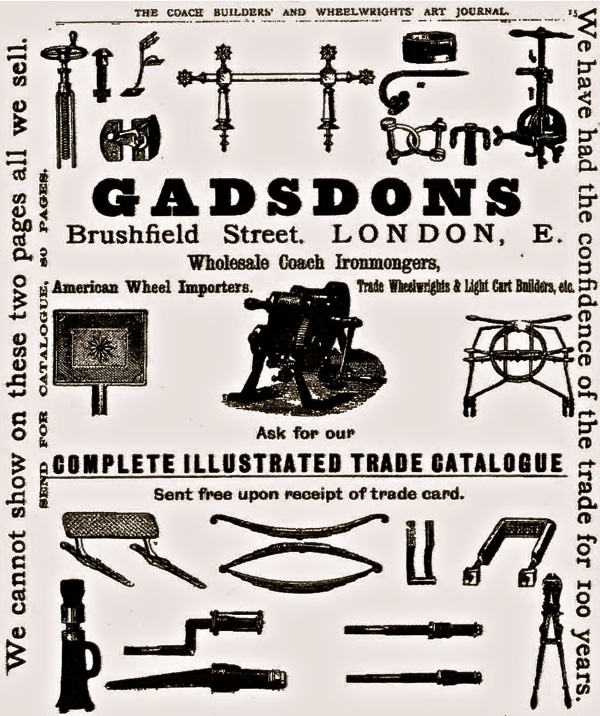 Joseph George Gadsdon( b1850 – d1903) Cabinet Maker from Bethnal Green was my Great Grandfather. The NZ Peter Gadsdon is my second cousin. I have in my possession a photograph of a Victorian advertising poster relating to the Coach Builders in Brushfield Street. I was very interested to see the photograph of the Trade Journal My husband is decended from Brown Bros of Great Eastern Steet, they produced a similar Trade Journal for their cars and bicycles about 1900. I was looking at your site to learn about the silk workers in Spitalfields because I am descended from Andrew Sollicoffre from St Gallen in Switzerland who was described as a Dyer in 1754 and a Mariner in 1758, but died before his 16 year old son was apprenticed to a Cabinet Maker in 1774. They lived in Spitalfields and my 5xgt grandmother Judith Esther Sollicoffre gave birth to her babies at the Lying in Hospital in Holborn. The girl born in 1754 was my 4xgt grandmother who married Robert Overton in 1780. I has taken me years of research to uncover this much, but scans of the manuscript records of the lying in hospital can now be seen on Ancestry! Now I shall be watching your Spitalfields website for mention of any Swiss residents in the eighteenth century. I am also wondering what connection (if any) there was between silk workers and William Bentinck, 2nd Duke of Portland, who was the President of the Lying In Hospital. I know he had a Swiss tutor, who stayed in his home after he grew up, but I’d love to now why he (and his duchess) recommended my ancestor to the hospital, where she had her keep and delivery free of any charges. I have just discovered Peter Gadsdon’s article and I was wondering if I might be related to him. My mother was a Gadsdon and her father’s name was Robert. They lived at 97 Wellington Row, Bethnal Green, a second cousin still lives at that address. I live in Halifax, Nova Scotia and have met a Gadsdon here who was Scottish. Im a Gadsdon and my family are out of Hoxton , My Dad’s name is John Gadsdon and his dad was John Gadsdon . I have a uncle Richard Gadsdon , My late Uncle was George Gadsdon. When I was young we lived in wellington way Bow .